letter: Making trouble in the UK? "A military coup by the Republican Guard"
Engineering construction: Solidarity can change the world! No trust in the Goldsmiths Trust! Defend accountable, state education! More houses for all, not “locals” vs migrants! Vestas workers – Up for a fight! 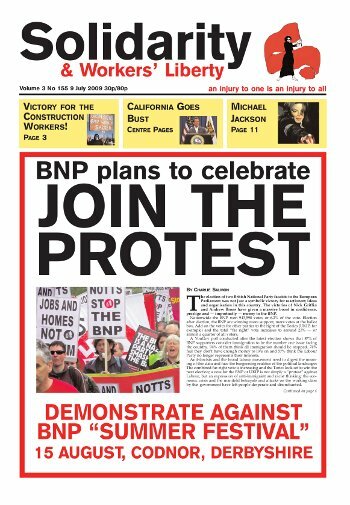 Workers' Liberty 3/23 - debate on the unions and Labour Party - is printed as a pull-out in Solidarity 3/155. Several dozen activists in the North East have signed the call issued by Workers’ Liberty for a new Socialist Alliance. There is special interest in the area because of the existence of groupings such as Tyneside Socialist Forum and Teesside Solidarity Network — forums in which socialists from different tendencies and none can come together in common activity and debate. AWL comrades attended a meeting at the SWP’s “Marxism 2009” event (2-6 July) on “Islamism and the new Arab left”, in fact mostly about Egypt. Listening to Anne Alexander’s talk, you learned a lot. But the overall picture she presented was hopelessly mangled by the SWP’s confused theorisation of political Islam. The political conclusions it suggested are the same as those which three decades ago led to catastrophe for the left and the working class in Iran. Martin Donohue recommends Democracy is Power, from the Labor Notes rank-and-file organising project in the US. In the last issue of Solidarity I recommended the Trouble Maker’s Handbook (also produced by Labor Notes) as an invaluable resource for rank and file union activists. This companion volume addresses the key question in any serious attempt at union renewal, democracy. Gemma Short reviews Panorama, BBC1, 6 July. Well done to Panorama for taking up the issue of police violence — their illegal tactics against legitimate protest when the majority of the mainstream media is currently still ignoring it (except the Guardian). Sometimes great minds think alike — or at least minds focussed on spreading the word about working-class struggle. The timing of Martin Donohue’s tribute (Solidarity 3/154) to the US Labor Notes publication A Troublemaker’s Handbook (TMH) coincides almost exactly with the National Shop Stewards’ Network’s latest conference in London on 27 June, where as NSSN Education and Publications officer I issued an appeal for a British “Troublemaker’s Handbook” — with the rather less snazzy (provisional) title Tips and Victories. Michael Jackson’s life and death raise a number of issues that socialists should be interested in. Abuse: Jackson’s father Joe physically and psychologically abused him while a child. As the manager of the Jackson 5, the band Michael and his brothers were in as children, Joe relentlessly forced them to pursue fame. He would punish the children with whippings. Michael would claim in later life that he had no childhood and that in his youth he would often vomit on seeing his father. I’ve been thinking about Michael Jackson a lot this week. This is hardly surprising given the massive media coverage and that, well, everyone is talking about it. Within hours of the news breaking, the inevitable jokes were already doing the rounds. Generally, I’ve got a (probably quite inappropriate) weakness for dark humour. However, on this occasion, I was struck by it all being quite sad. US troops, backed up in a small way by British troops, have launched a big offensive in the Helmand district of southern Afghanistan. The offensive is part of US president Barack Obama’s military build-up in Afghanistan. He has sent 21,000 extra troops already this year, and by the end of 2009 US forces are due to number 68,000, double the 2008 level. The immediate objective of the offensive is to secure the area so that voting for the scheduled Afghan presidential election can take place on 15 August. “Generally they are short and dark-skinned. Many stink because they wear the same clothes for weeks. They construct shacks to live in on the outskirts. When they aspire to live in the city centre they rent ugly, run-down apartments; they appear at first, two of them looking for a room and a kitchen, and soon after a few days there are four of them, then six, eight, 10 and what have you.